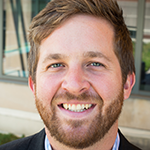 Brenden Sloan is responsible for managing our major donor program and advancing collaborative grassroots fundraising efforts across the Jobs With Justice network. Brenden has seven years of fundraising experience in the nonprofit and for-profit realms. He has launched or managed individual giving programs at EarthRights International, Human Rights USA and Chora Creative, where he consulted with museums and science centers across North America. Brenden holds Bachelor of Arts degrees in Spanish and International Affairs, as well as a graduate certificate in International NGO Management from James Madison University. While at JMU, Brenden founded and led two student service trips to New Orleans and La Ganove, Haiti, and taught English classes in Argentina and Virginia.